A Blanket for Baby - Coming Soon! - Building Families, Inc.
A Blanket for Baby – Coming Soon! Guess who is 23 weeks already?? It seems like we just had a positive pregnancy test! Congratulations Selena on passing the halfway point and doing it so gracefully!! 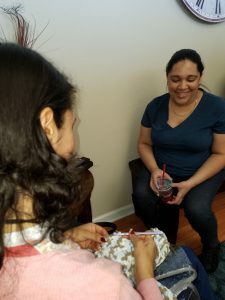 Selena and Carol were in awe of how fast the mom-to-be could knit! She is making a blankie for her baby. Awwww! ← Fingers Crossed for Tomorrow!